Sportscars are a breed like none other. Compact, low-slung, agile and if you will, quick as hell. Instead of having large motors and insane horsepower and torque, they try to pull out maximum from mid-sized motors and try to keep the weight low to have power-to-weight ratios as good as supercars with massive V10s and V12s. And over the years, if one car has got its name at the top of the ‘legendary cars of all times’ list, it has to be the Porsche 911. For us petrolheads, only these three numbers – 911 – is good to give us goosebumps. The 911 is now in its eighth generation and the brand is now in its 55th year. Almost everything that you see has been rethought of and reengineered. It’s been codenamed 992 and it’s the first all-new generation 911 in the past six years, and if we were to go by what Porsche has been saying for the past six months, it’s the best one so far. The design is more of an evolution than a revolution from its predecessor – just like most of the 911 generations. It looks more muscular and at the same time retains the iconic curves and creases to what you and me relate to when someone says Porsche 911. This is the first 911 that gets an active spoiler to increase the downforce. And without doubt it’s the most tech-laden Carrera of all times. Lot has changed on the inside too. The cabin now looks less cluttered and has a more clean and pleasing look. A big touchscreen sits in the centre of the dashboard, and buttons and the knobs that did many things on the previous gen have now made space for touchpads. The instrument cluster is part digital, part analogue and is capable of throwing insane amount of information at you. And that includes driver aid info, navigation, infotainment along with car stats. The seats are comfortable and hold you in place, even if you’re riding shotgun with the Stig at a racetrack. It’s got rear seats too. But it’s not much space unless you’re a four-year old or a loaf of bread. A lot of steel from the previous generation, the 991, has been replaced with aluminium to save weight. It sits on a new platform called the MMB, which will make the underpinnings of all future mid-engined Porsches. But despite all the weight saving, it’s still 55kg heavier than the previous model. And that’s because of the new gearbox that I’ll tell you about in a bit and a new particulate filter. But on the bright side, the weight is optimally distributed between the two axles. And that gives the 911 the most quintessential characteristic of the 911, the fine balance and the precision. On the winding roads, the 911 goes exactly where I want it to. It’s all predictable, with no surprises. Most sportscars that I’ve driven on such mountain roads show the excitement and the willingness to offer a great time to the driver, but many fail to offer the precision – they’re either too twitchy or they’re too under-steery. The 911 sits right in between that. Whatever you do with the 911, there won’t even be a hint of understeer and it’ll allow you to place a coin on the road and go over it every time, no matter what speed you do it at. The steering weighs up just right and there’s adequate communication from it to your palms. Even in this spec, the Carrera, the mildest one of the lot, it’s still very potent and quick. The engineers at Porsche have redone the suspension on the 911. In the first place, there wasn’t anything wrong that you could point out, and it’s almost unbelievable what the Germans have done with it. The suspension has got more travel now, which allows it to soak in deeper bumps without bottoming out. The setup has also been tweaked to offer the best of the ride quality without affecting the sharp handling skills of this legend. One thing that hasn’t changed from the previous gen is the engine block. But just the block, rest of the bits on the mill are all new. And with the help of two new turbos, the 2981cc, flat six cylinder engine now makes 445bhp and 530Nm of spin, that’s an addition of 28bhp and 30Nm over the previous one. Porsche have tuned the engine to rev hard, really hard. It busts the myth that turbo-ed engines can’t rev hard. This one redlines at a staggering 7,500rpm. In a way, this turbocharged flat-six engine behaves like a naturally-aspirated mill and delivers outrageous performance no matter where the rev-meter needle is pointing. By Porsche 911 standards, 445bhp may not sound very exciting, but trust me, it’s all you need – all the power is accessible most of the time. Gone are the days of seven-speed PDKs. Porsche has done with that and got in a new, fabulous eight-speeder instead. It’s got a shorter first gear to help it get off the line quicker and longer seventh and eighth gears to help the engine sip fuel more sparingly at highway speeds. In terms of briskness in changing cogs, this transmission may be second to none. It’s extremely quick-thinking and quick-reacting to your power needs and gives you the perfect gear to get the job done. And all of that shows in the way the new 911 propels to the horizon. From the previous generation, this 911 shaves off 0.4 seconds, and cracks a ton in a mere 3.4 seconds. That’s supercar stuff! 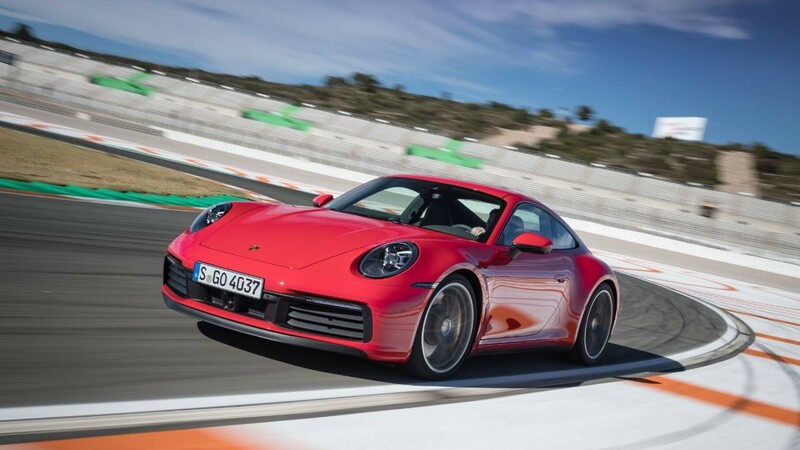 The new 911 has got the balance, precision and the will to take on a mountain and offer the better driving dynamics than any sportscar out there. A lot of credit for that goes to the additional 45mm between the two rear wheels that give it stability at high speeds. But is it a track tool? To find out, I took it around the Circuit Ricardo Tormo, on the outskirts of Valencia. This racetrack is real technical one, and meant for Moto GPs, so for a sportscar, these tight bends are going to be the ultimate test. Does it fair well? Most AWD sportscar offer tons of traction around a racetrack. But if you go in hot into a corner, they have a tendency of understeering. The 911 isn’t one of them. It somehow knows where it’s supposed to go and points its nose exactly there. With the way this is built, it makes an average Joe look like a pro. And once you shift to Sport Plus mode, it’ll make the pedals and other responses razor sharp and setup turns the 911 into an ideal track machine. With the active spoiler, there’s plenty of downforce and hence traction at the rear, to give you the confidence to go in to a corner at speeds you otherwise wouldn’t have dreamt off. The new 911 will be retailed at about Rs 2 crore (ex-showroom) when it comes to India, late this year. This sportscar gives you all the reasons to look away from its rivals and gives you a brimmed-with-tech, agile, exciting package that no other carmaker can offer. It’s a big step up over the previous gen and the Carrera S and the 4S do what the GTS would do in the previous avatar. It doesn’t have the drama of the AMG GT and the wildness of the Jaguar F-Type, but it’s got the balance, precision and above all the fun to drive nature that’s quintessential to all sportscars. And that, in my eyes, is good enough to make it the best sportscar in the world. Verdict: The best sportscar in the world. Period.